What’s better than life on the beach? This exquisite ocean/island/mountain dream view is just what you need to start living your best (and perhaps longest!) life in Maui. Nestled at the base of the West Maui mountains sits this newly listed four-bedroom, four-full-and-one-half-bathroom retreat with 2,884 square feet of indoor-outdoor entertaining. The home is decked out with timeless finishes, including travertine floors and imperial plaster walls with mahogany and merbau woods found throughout the estate. And that sparkling, resort-style pool is giving us major FOMO! Buyers will love the outdoor areas which are ideal for splashing around and soaking up the sun. Aside from the pool and water features, there’s a spa and fire pit surrounded by lushly landscaped grounds offering the ultimate in privacy. Bonus – the monthly HOA is only $138 and the property is being sold furnished with a few exceptions. 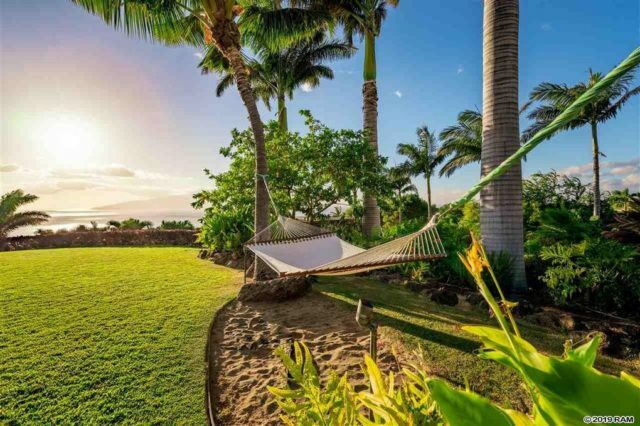 For a little under $4 million, we think this Maui oasis is a worthy splurge. Ray Chin with Hawaii Life has listed 972 Kai Hele Ku Place Apt A, Lahaina, Hawaii for $3.998 million. Our Steal: Courtney Brown of Island Sotheby’s International Realty has listed 106 Kaanapali Shores Place Apt. 405 in Lahaina for $625,000. For a fraction of the price, you can still live the Hawaii life, just with a smaller, more conservative footprint. This one-bedroom, one-bathroom, 647-square-foot condo may be tiny, but its charms are mighty. First off, you can’t beat the price! And it is touted to have an excellent rental history if you are looking to make some cash on the side. This would be a great second home or primary residence for empty-nesters seeking location and beauty without the maintenance of a big house. But it’s the spacious floor plan and wall of windows showcasing tranquil oceanfront views that really sell this steal! We love the open-concept kitchen and living space which stretches out into an enclosed lanai for taking in the ocean views and listening to the waves crash upon the shore. This condo cutie is also in a serene location! Tucked off the main road on the north end of Kaanapali Beach, you’ll have easy access to Lahaina and Kaanapali shopping and dining, plus nearby Honokowai neighborhood markets. The best part? Maui most popular beaches are just a short walk down the shore. Courtney Brown of Island Sotheby’s International Realty has listed 106 Kaanapali Shores Place Apt 405, Lahaina, Hawaii for $625,000. If that doesn’t satisfy your Hawaii fix then click here to peruse more second shelter coverage of the Aloha state.